There’s "no such thing" as man-made islands in the disputed South China Sea, Beijing said on Thursday, adding that all construction work presently underway in the area is for civilian purposes only, including some "necessary defensive facilities." Beijing has laid claim to nearly all of the resource-rich South China Sea, through which an estimated $5 trillion worth of trade passes each year. The dispute over the area involves the Spratly and Paracel Islands. Beijing’s territorial claims to the islands partly overlap those of the Philippines, Vietnam and Taiwan. China also has ongoing territorial disputes in the area with Malaysia and Brunei. A tribunal at The Hague said in a ruling last July that “there was no legal basis for China to claim historic rights to resources within the sea areas falling within the ‘nine-dash line,’” referring to a demarcation line on a map of the sea from 1947. Beijing has ignored the verdict, however, saying its islands come with exclusive economic zones, where Chinese people have had activities for 2,000 years. Chinese Foreign Ministry spokesman Wu Qian noted on Thursday that China had every right to carry out the construction work as the Spratlys were inherent Chinese territory. 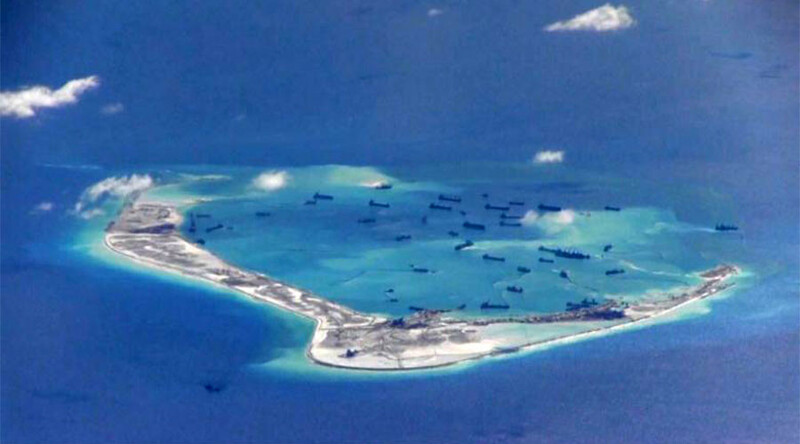 "There is no such thing as man-made islands," Wu told a regular monthly news briefing, as cited by Reuters. "Most of the building is for civilian purposes, including the necessary defensive facilities," he added, noting that some countries outside the region are seeking to stir things up and create tensions. On Monday, a report from the Asia Maritime Transparency Initiative, Washington’s Center for Strategic and International Studies (CSIS) branch, warned that Beijing is preparing to station warplanes and other military hardware on the artificial islands it has built on the Spratly archipelago. The report said that Beijing has “largely completed” its military construction on the Fiery Cross, Subi, and Mischief Reefs of the Spratly Islands. 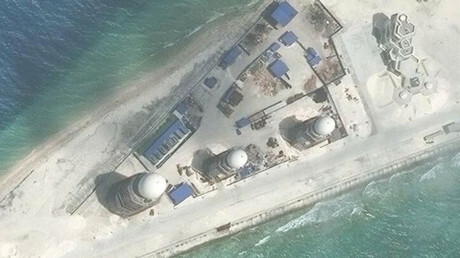 “Beijing can now deploy military assets, including combat aircraft and mobile missile launchers, to the Spratly Islands at any time,” the US think tank said, after examining satellite images of the area taken earlier in March. “China’s three air bases in the Spratlys and another on Woody Island in the Paracels will allow Chinese military aircraft to operate over nearly the entire South China Sea,” the report added. Asked to comment, Chinese Foreign Ministry spokeswoman Hua Chunying told a briefing on Tuesday that Beijing has every right to build military defense facilities on the Spratlys, as they are part its territory. 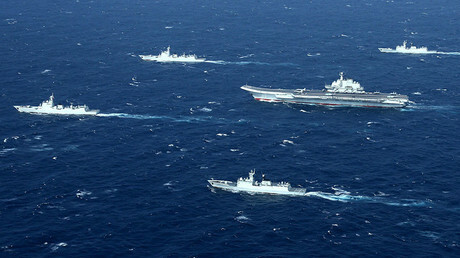 China said earlier this month that it is building a “first-class navy” to seize any aircraft or vessels entering areas under its control. “We will intercept any intruding aircraft and follow every military vessel in areas under our responsibility,” Wang Weiming, deputy chief of staff of the Chinese People's Liberation Army Navy, told Xinhua news agency on the sidelines of the annual session of the National People's Congress (NPC) in mid-March. To counter the Chinese military buildup and growing “threat,” Taiwan also warned this month that it plans to upgrade its military with cutting-edge weapons. The island’s Defense Ministry said it wants to upgrade its F-16 fighter jets and revamp its navy with submarines and fast attack craft. It is also seeking to acquire more surface-to-air missiles as well as cutting-edge stealth aircraft from the US. China's Defense Ministry said on Thursday it was useless for Taipei to think it could use arms to prevent unification, Reuters reported. China considers Taiwan to be a part of its territory with which it will eventually be reunited. The island has been de facto independent from mainland China since the end of the civil war in 1949.